The challenge of painting water brings me back to this location, time after time. The boathouse might be the focus, but it is the reflections, the ripples, the light and shadow, which makes me paint this lake from a variety of angles. It is close to home, has amenities and lots of people around, so it attracts me and my artist friends. I have also seen photographers having a class there. Lots of ducks nest around the huge roots which jut out from the ground and sometimes are in the water. Those roots and ducks have also been in some of my paintings. One of those roots is just beyond my easel. On this occasion a few of my plein air artist friends were there for a student of the University of California, Riverside, who was filming a documentary. She and her cameraman did long takes on the painting processes of my friends and myself. 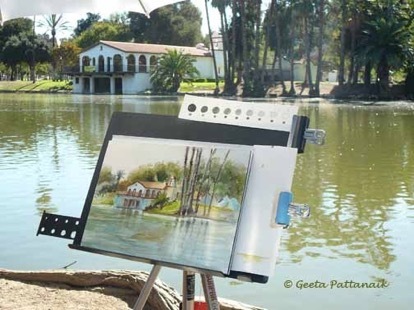 This plein air watercolor easel is one which I got not too long ago and is very easy to use. I always clip a paper with the value scale on my board and a piece of paper to try out paint mixtures before painting. It also has a place to insert brushes of various sizes and a tray with wells for paints. The tray also has a hole to insert the water container. On this occasion I had the tray on the side, as the ground was very uneven and I could not fit the tray just above my knees in a comfortable position. The same tripod can also be fitted to an oil painting attachment, which I also use. Both together were some of the best investments I have made in my painting gear.